Good morning friends! 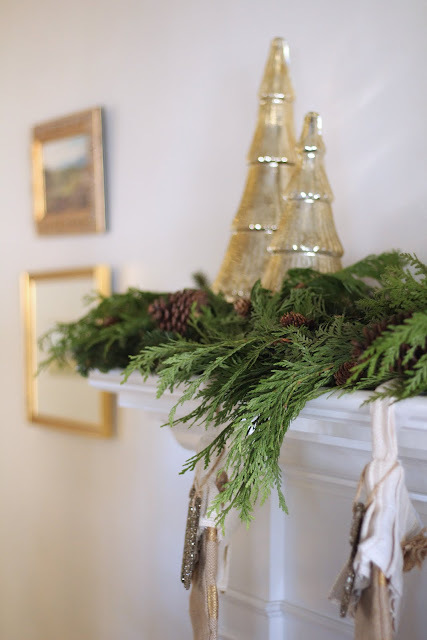 I am so happy to be part of another Holiday Home Tour! If you’re a regular reader, you know that this is my second tour of the season (my first tour can be seen here). 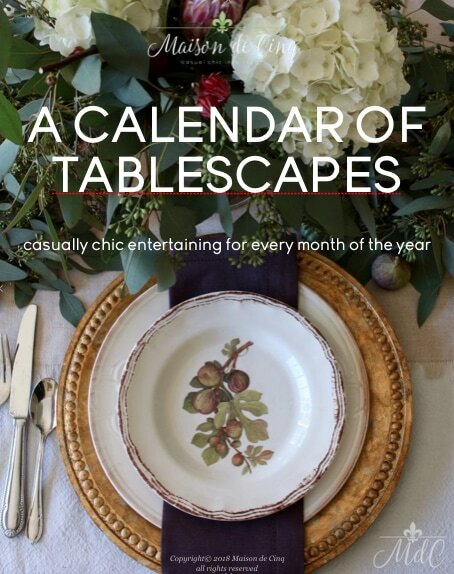 And if you are coming here from my talented friend Kathleen at Lindsay Hill Interiors, thank you! I’m so glad you’re here! This time fifteen bloggers (yes, 15!) have collaborated to bring you a Home for the Holidays blog tour where we have each decorated our homes for the holidays in our own personal style. From mod, to chic, to transitional, to French country, to farmhouse – there is a style here for everyone! So come on in, take a look around, and get inspired. Also, we have some super exciting news to share! King of Christmas, who is one of our sponsors for this tour, has kindly agreed to giveaway a Christmas tree (details about that at the end of post)!! I know there are a ton of tours this time of year, and I am so thankful that you’ve decided to stop by ours…… Welcome! 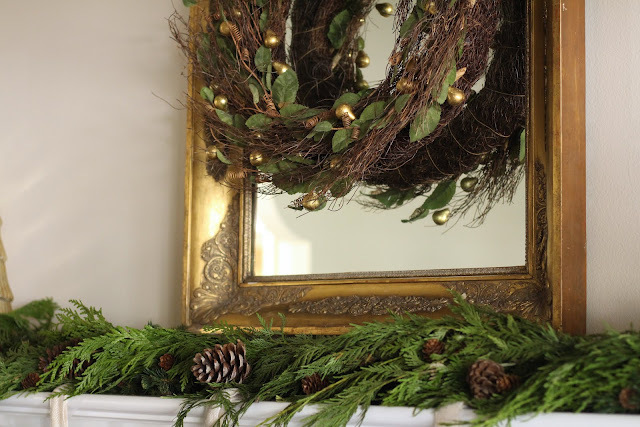 On my first tour, I shared with you how I’ve been wanting to switch to a more neutral and natural Christmas, which for me meant getting rid of the red. 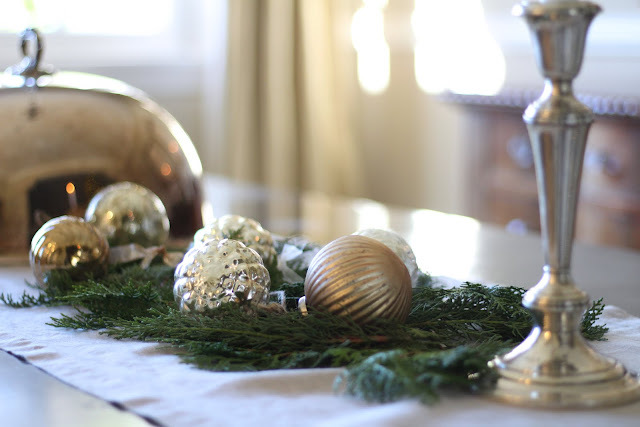 I have used greens, whites, creams, and gold and silver as my colors of the season. I love that they convey Christmas without being over the top. I’m a huge fan of bottlebrush trees; both vintage and new. I’ve collected them for a few years now and I usually add a couple new ones each year. This year I couldn’t find any vintage ones (so far!) but I did get a few new ones. The ones I purchased at World Market are here, and there are also options here, and here. 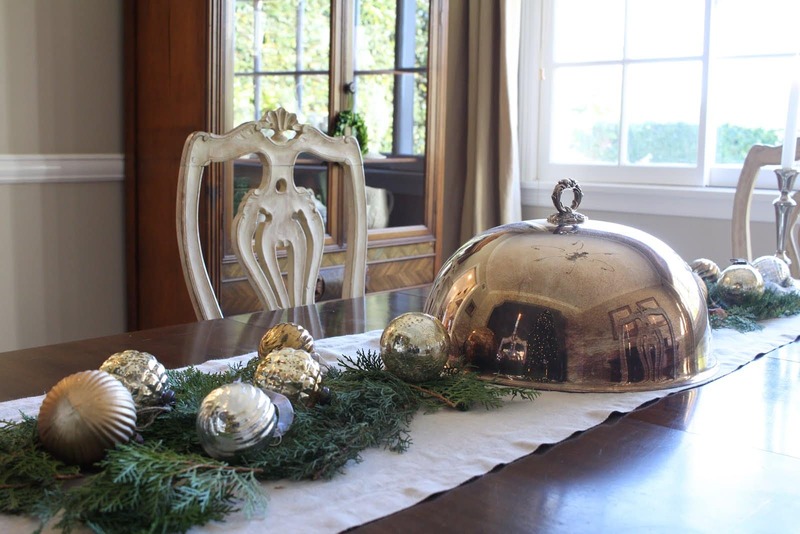 I adore mercury glass ornaments and use them in my holiday decor quite a lot. I’ve found some sources for mercury glass ornaments here, here, here, here, here, here, and here. I love the shimmer they give! 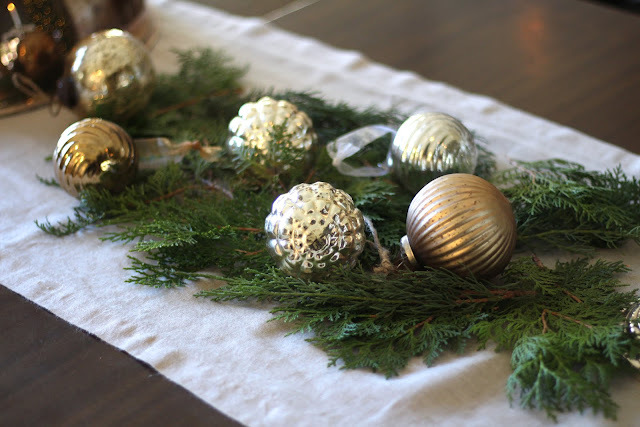 In the dining room I again used the mercury glass ornaments, just laid on the table with simple greens I clipped from my yard. 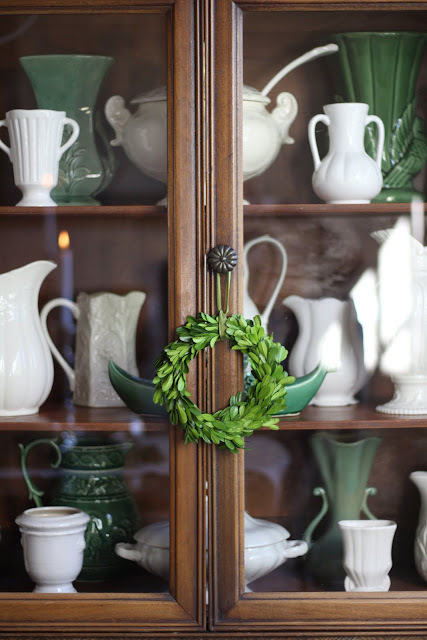 My collection of vintage ironstone mixed with new white dishes is always in the dining room china cabinet, but this season I added some green vases to celebrate the season. And a tiny boxwood wreath! Similar here, and here. Last year when I began the process of changing to neutral colors, I purchased new stockings. I can not tell you how excited I was to find these! First of all, I adore burlap, and on top of that, they actually had all the letters that I needed for our names! I found a few similar options this year here, and here. 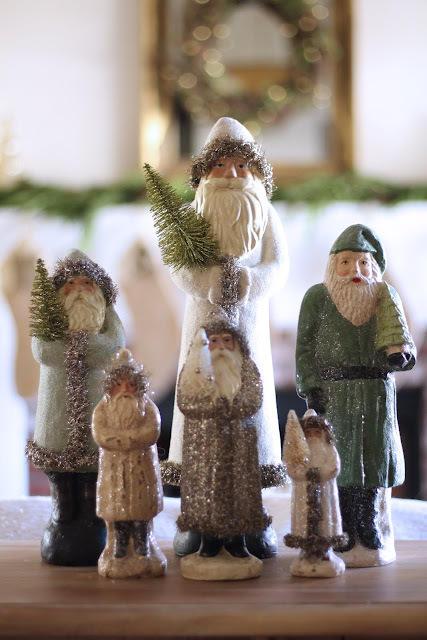 These vintage looking Santas are another favorite of mine! They are a mix of Home Goods finds with ones purchased at a local antiques store. However, I’ve found them a little more difficult to find this year! I did find some great options here, here, here, and here, and adorable ornament versions here, and here. I just love their old-fashioned charm! 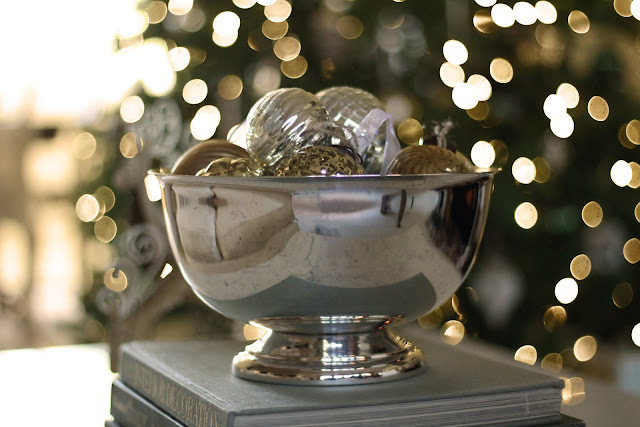 More mercury glass balls in a vintage silver plate bowl. 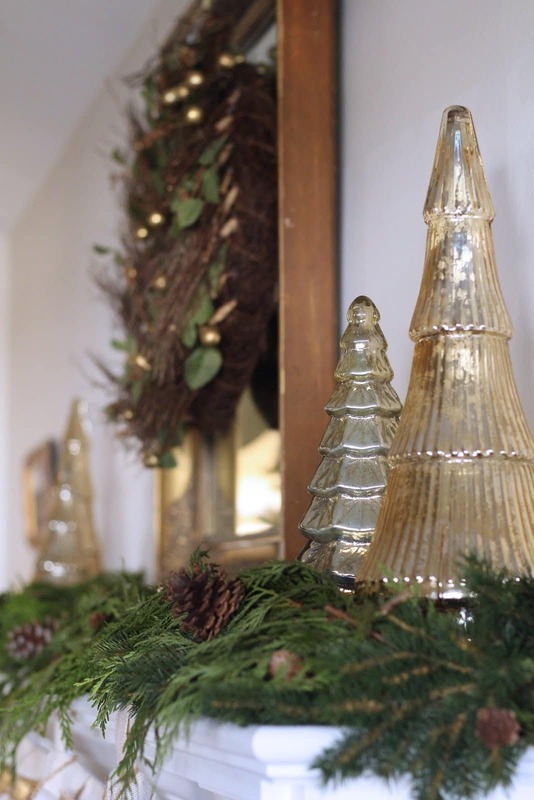 Mercury glass trees mixed with fresh and faux garland decorate the mantel. I added some pine cones that I collected. Mercury glass tree options here, and here. An old Restoration Hardware wreath hangs on the mirror over the mantel. I filled a chippy French urn with white hydrangeas and some greens from Trader Joe’s. I love to mix fresh flowers in my decor no matter what the season. 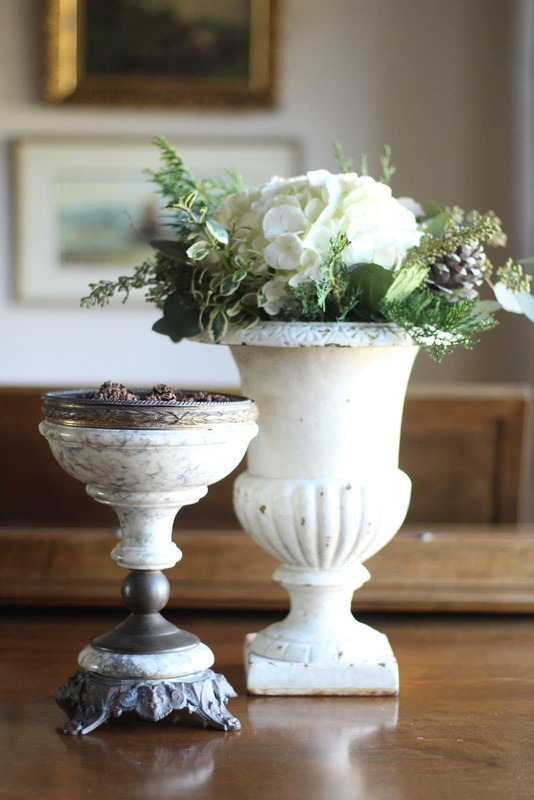 The urn and the pedestal bowl are both vintage. But since vintage ones are so difficult to find, here are a couple reproduction versions that give a similar look here, here and here. And the central feature of the room is the 9 foot tree so generously provided by our sponsor, King of Christmas! 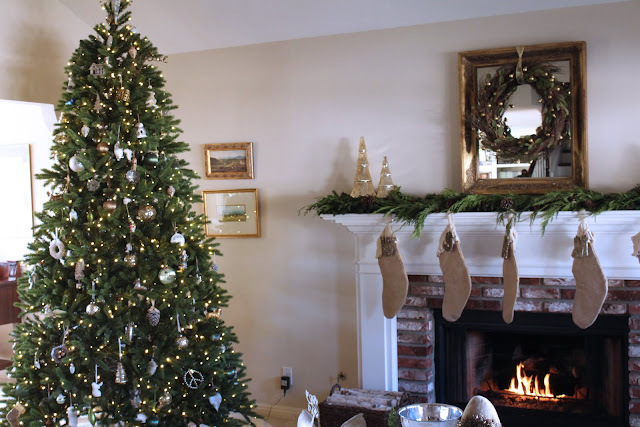 In the past, I’ve had a live tree in here and a small faux one in the family room. But when I found out that King of Christmas was going to provide us with a tree, I thought I should get one a little taller than we’ve had before and put it in the room that gets seen the most, which is the living room. And I am so happy with how real it looks! Also, this tree was super easy to set-up. We literally took it out of the box and set it up in a matter of ten minutes. And it has a nifty little pedal that you step on to turn on the lights. No more digging around under the tree for the plug… genius! Last year was the first time I’ve ever used wrapping paper that matched my decor, and I have to say, I’m hooked! I can’t believe I used to have a million different patterns under the tree. Now I use mostly craft paper, with just a few papers that have the greens, golds and creams mixed in and I love how it looks. It is just a simpler, quieter look that really speaks to me right now. And believe it or not, I’ve never done garland on the stairwell before. This is a first for me! 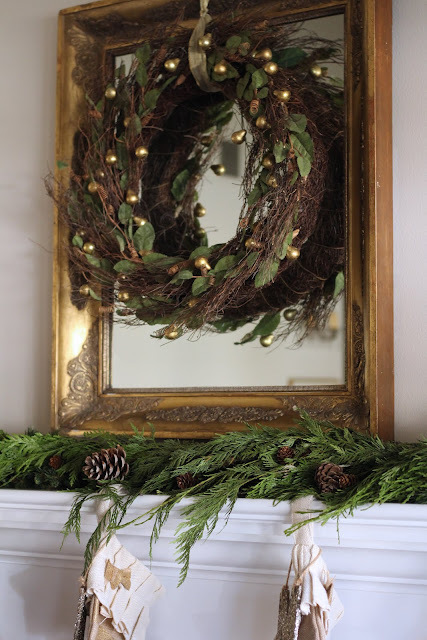 These were from Trader Joe’s and I simply added the burlap ribbon. Thank you again for stopping by! I hope you will take the time to pop over to Amy at Crazy Chic Design next, and then on to the other homes from there. These are some amazing bloggers and I know you’ll find ideas and inspiration from all of them! Thanks again for stopping by and Happy Holidays everyone! If you’d like to see my first tour from last week, you can click here. And for last year’s tours, Part One is here and Part Two is here. Thank you so much Julie! Your home and your blog are such an inspiration to me, so your compliment really means a lot! It's so beautiful! Thank you for inviting us into your holiday home! Thank you so much! I appreciate your kind words. 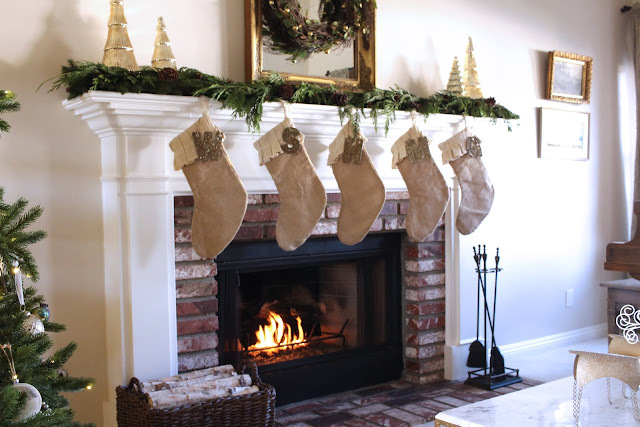 The stockings were a favorite find for sure! Thank you sweet Amie! I hope we get to do more in the future – this has been so fun! Thank you so much for the lovely compliments Joni, I so appreciate it! Thank you so much Lauren! And thanks for stopping by! Sheila, Thanks for sharing your lovely home with us! 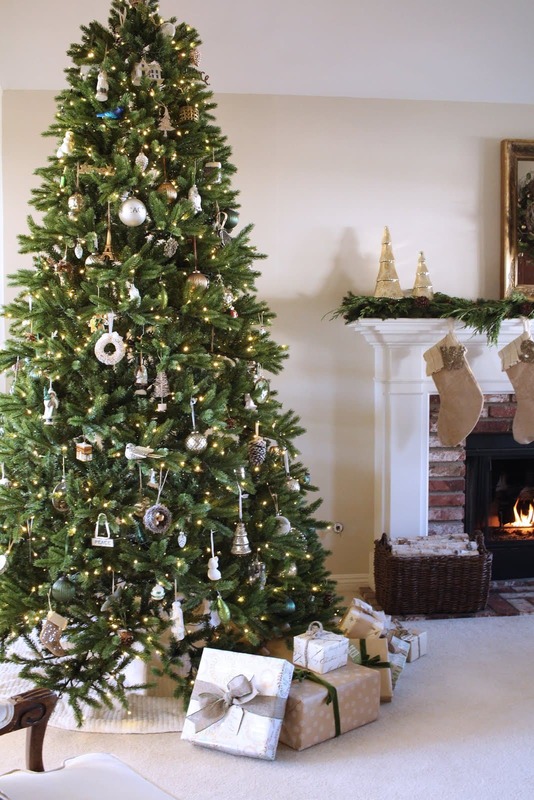 (And for the chance to win the Christmas tree!) 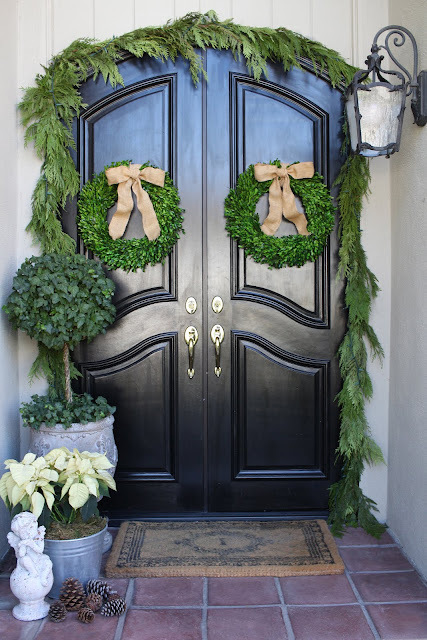 Your front porch is beautiful, and I love that burlap ribbon with the green edge on your stairs. Merry Christmas! Loved your tour. The burlap stocking are amazing! I ❤ the garland on the staircase, its perfect! 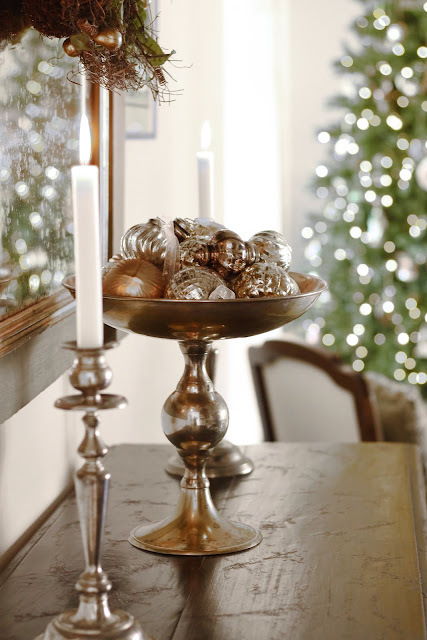 I also like mercury glass, and try to add a little in each rooms décor. Sheila, Absolutely love your home tour! Classic elegance as always and love all of your vintage touches! Lacey and I are so grateful to you for bringing us into this group and truly appreciate your support and friendship!! I love how clean and fresh you style is. Thanks so much for stopping by my friend! And thanks for all your lovely compliments! I know what you mean about the red – it's hard to get rid of! I had a hard time even finding ornaments or wrapping paper without it:)) I will probably bring it back another year, but I'm loving this for now. Oh my goodness, thank you Tammy! I appreciate that so much! 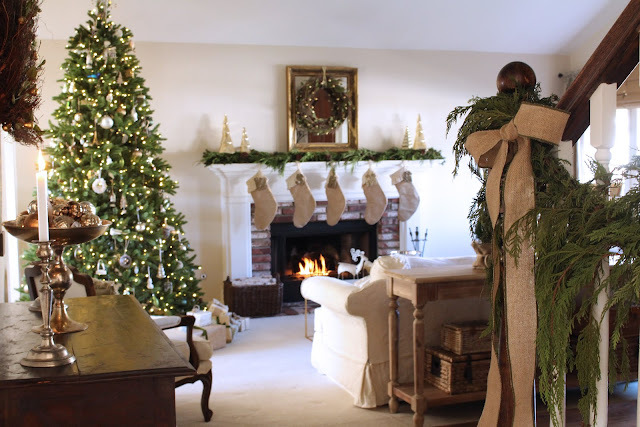 Oh what a beautiful neutral Christmas decor you have created, Sheila…… I love burlap too and those stockings are a great find…I have tried to do neutral and the red keeps creeping in. Your home is stunning! And your photos look like they are straight out of a magazine! Your color scheme is so elegant. Perfection! Thank you so much Amy, I appreciate that so much. Your support and encouragement of "little old me" this year has meant so much. I can't thank you and Janine enough for taking me under your wings and for including me with such a wonderful and talented group. Love you guys! Thank you Nancy! And yes, Trader Joe's is the best! I actually had to go elsewhere for the garland on my porch because my TJs was sold out for weeks. And like you, I adore going to blog tours! it's so fun to see what everyone does. Thanks so much for stopping by, I truly appreciate it! Thank you, I have to say I'm very happy with the King of Christmas tree! I've been impressed with the "realness" of it! And thanks so much for your compliments. Happy Holidays! Thanks so much Laila! Have loved doing the tours with you! Thank you so much Nicole! And thanks for stopping by – I so appreciate that you took the time to come over and visit! Thanks so much! That was what I was trying to achieve, so hopefully I did! You are so talented and creative and I have loved doing the tours with you this year! Thanks so much Joan! I'm so happy to have met you this year! I've had such fun getting to know you and doing the "hops"! Thank you so much Janine! I so appreciate your compliments, and even more, your support this past year. Your encouragement and inclusion of me, the "rookie blogger" means so much! I am truly honored to have been a part of this tour with all of you. Thanks so much Joey! And so glad to hear you're an email subscriber – yay!! Thanks for your support and for subscribing, I so appreciate it! Thank you for the lovely compliments Patti! Hope you have a wonderful holiday season! Thanks so much! I so appreciate your kind words and your stopping by the blog! Thanks very much! And good luck! Aww, thanks so much Chris! And thank you for stopping by and taking the time to comment! Thank you so much Summer, for everything! I feel like I've known you so long, and yet it's only been this year. Your unwavering support and friendship has meant so very much! Thank you so much Gloribell! That means so very much. 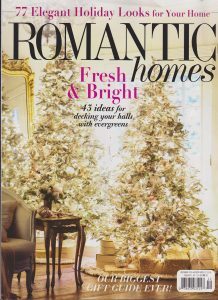 You know I love your home and style so it is especially nice to hear coming from you! And I'm so glad to have met you this year and to have done the tour with you! Merry Christmas and thank you for everything! Thanks so much Kim! Two of my favorites, too (obviously!) Thanks so much for stopping by! 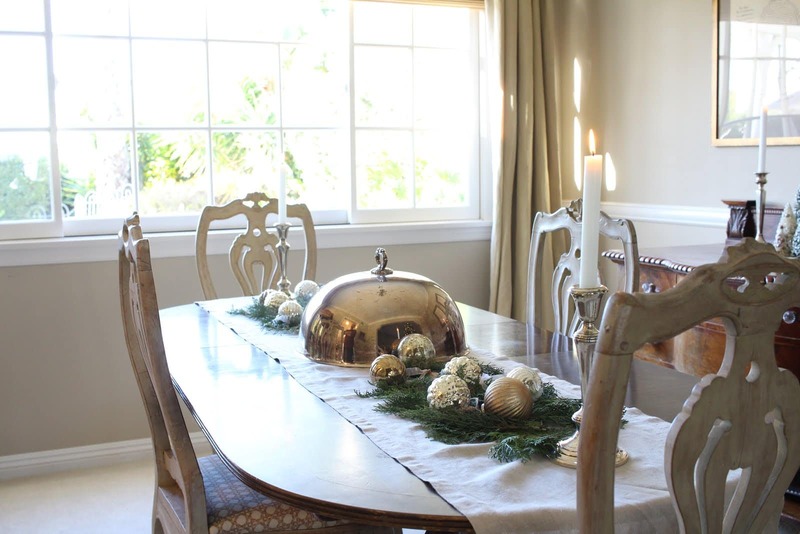 Sheila, such a classically beautiful home for Christmas! Everything looks amazing, and you've photographed it beautifully! The garland looks good on the stairs. I find such good stuff at Trader Joes too. I love to see how other people decorate their houses. 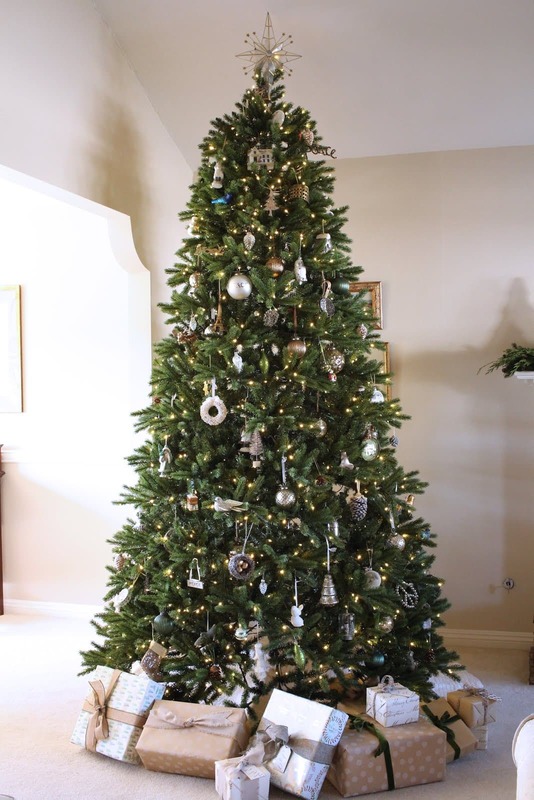 Your tree is beautiful and so lush and full looking! I too love all things mercury. I think you can never go wrong with them and the bottlebrush tress are adorable. Thank you for sharing! 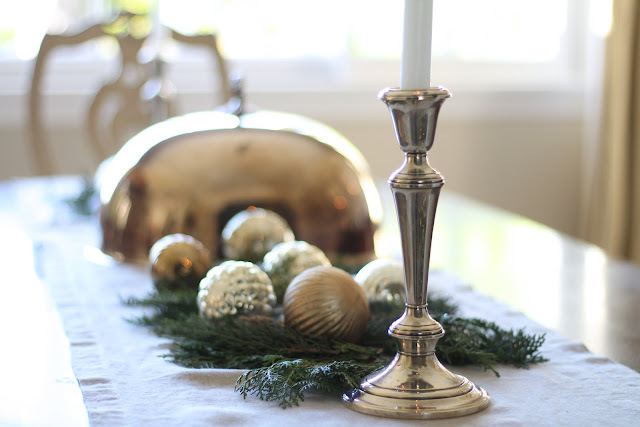 I love the simple elegance of your holiday décor. It certainly is an inspiration. Sheila, your home is just stunning! 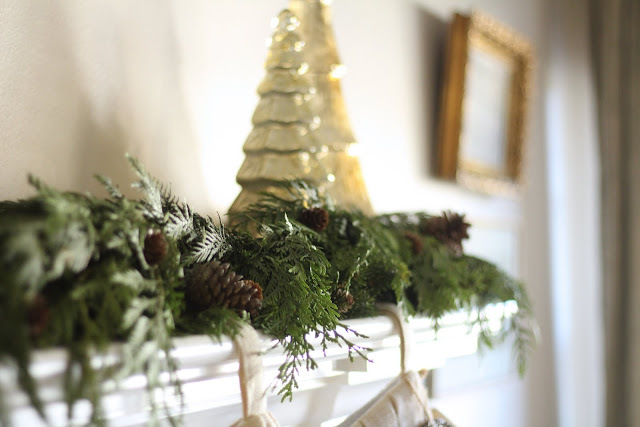 Love all of your Christmas decor. So timeless! Everything looks impeccable, Sheila!! I need to vie big time for your photo skills… gorgeousness overload! 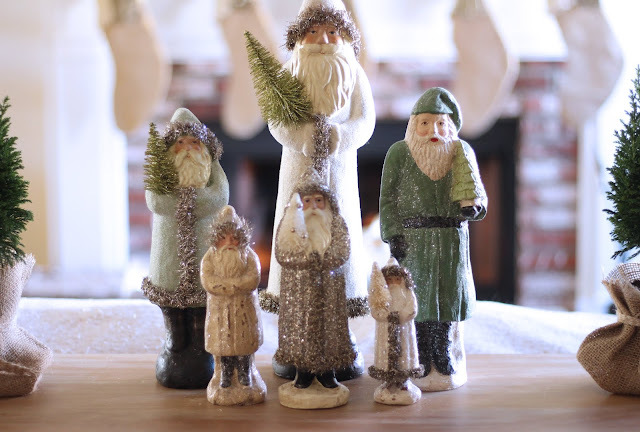 The santa collection is amazing and your Christmas tree was oh-so worth the wait! 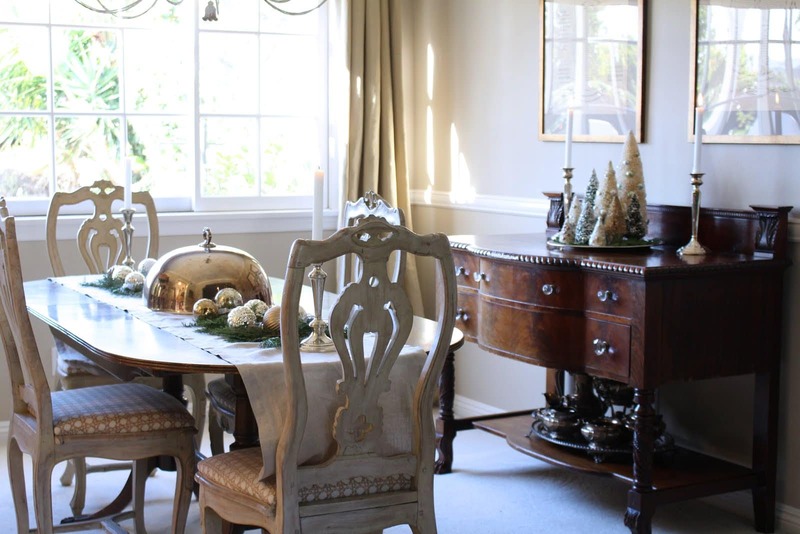 Your metallic and neutrals combination is so serene and beautiful, Sheila. I love it so much! You did a beautiful job – so glad to be on this tour with such talent! 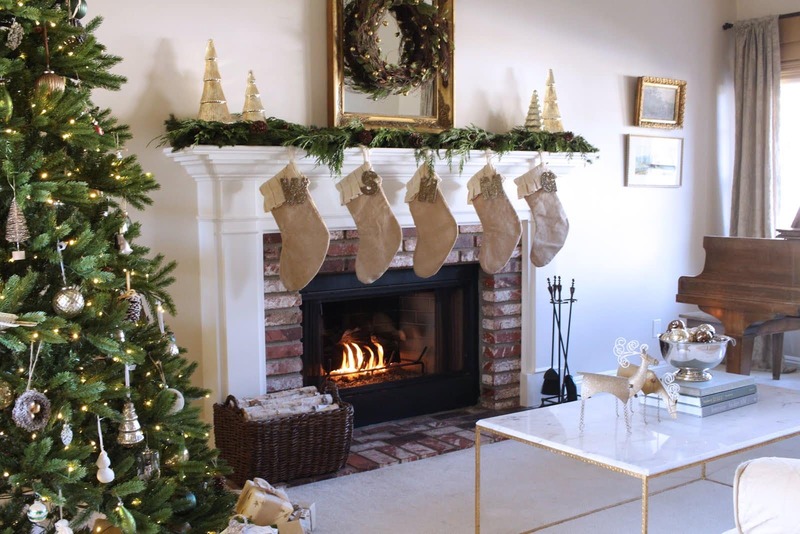 Your holiday home is gorgeous! Oh my, I love your Vintage Santa Clauses (sp?) They are so adorable and I love the cream and green that you collected! My goodness they even match your color scheme! Love it! 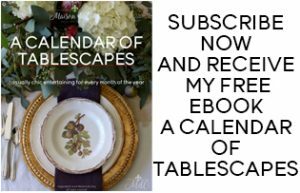 Thanks for sharing your home in our blog tour! Your home looks beautiful! I really love your stockings & wrapped packages! Thanks for the chance to win the tree! I'm an email subscriber as well. Gorgeous! 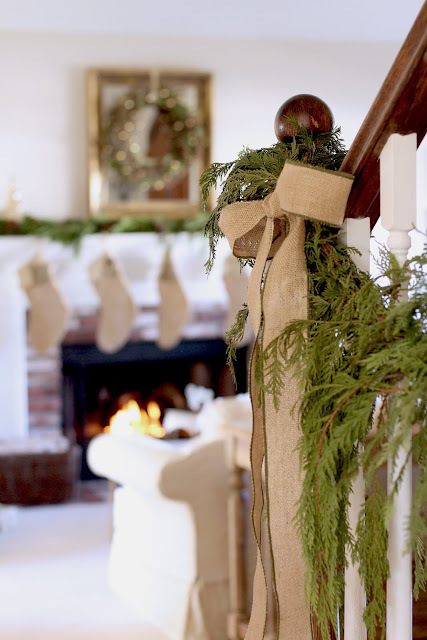 Love the burlap ribbon. And your tree is so nice. 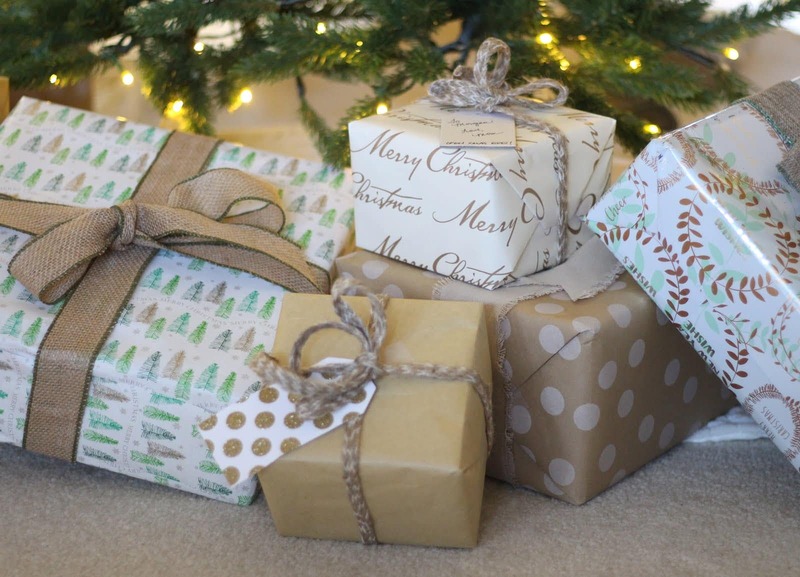 Even your presents are wrapped to perfection! You have great taste. I love the touches of natural greenery and vintage style. 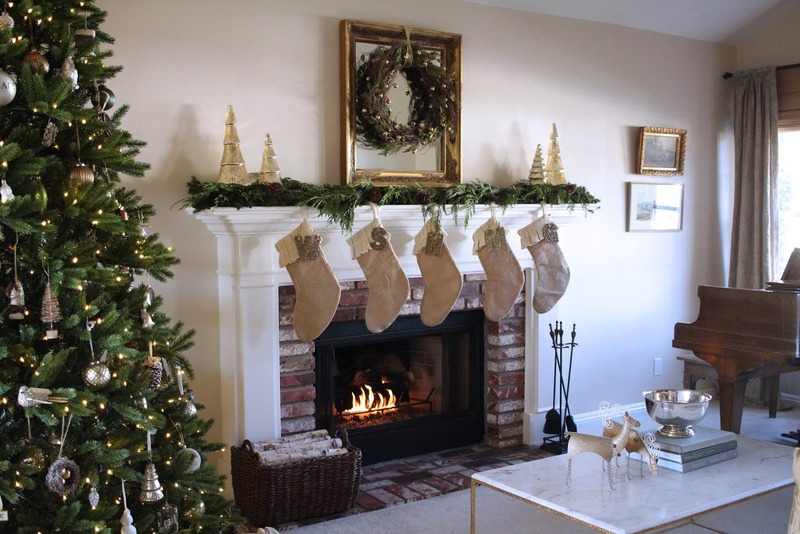 Lovely decorating! Thanks for the giveaway. Your Santa collection is my favorite but I agree: I love the foot pedal for turning on the lights!!! Sheila, the tree looks absolutely amazing, as does the rest of your home! I really love your collection of Santas, so sweet. Love everything Sheila!! Your home is amazing and I'm sure you will have the most beautiful Christmas with all of these gorgeous vintage goodies and your family!! Sheila! There is not one thing that you have not thought of, it is all so gorgeous! 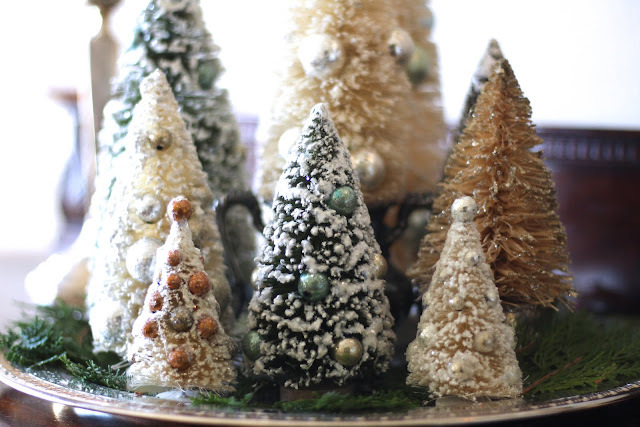 I love your Santas and the ornaments in a bowl, your bottlebrush trees, your table wow! And your garlands are so so gorgeous! 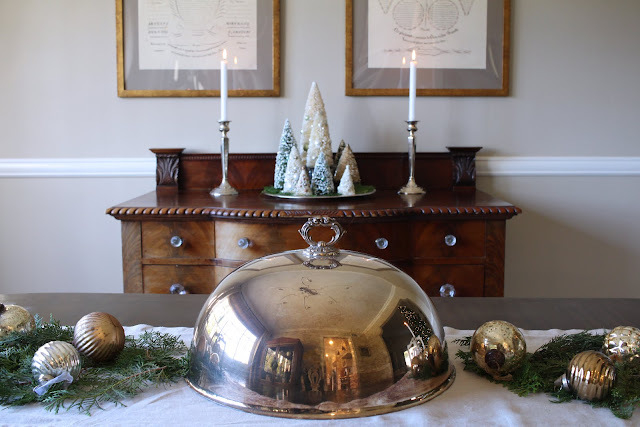 Love your home at Christmas, sweet friend! Merry Christmas to you and your family❤️️?? This is gorgeous! Like I said before, your taste is so similar to the things that I like. 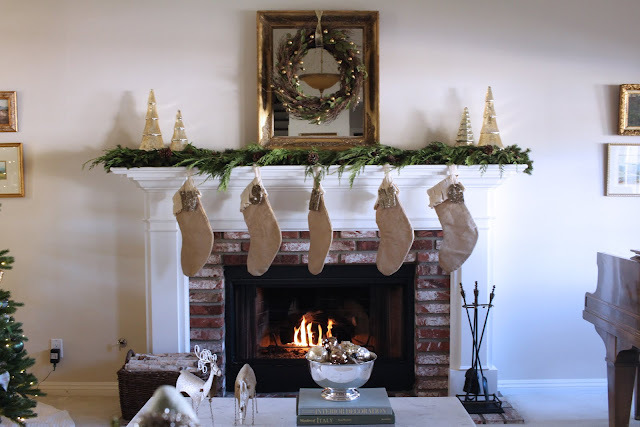 A year ago I also used some burlap stockings over our mantle. I made them by cutting some pieces from a burlap bag of coffee beans. LOVED THEM! Thanks for sharing your beautiful and welcoming home! I was so looking forward to your tour! 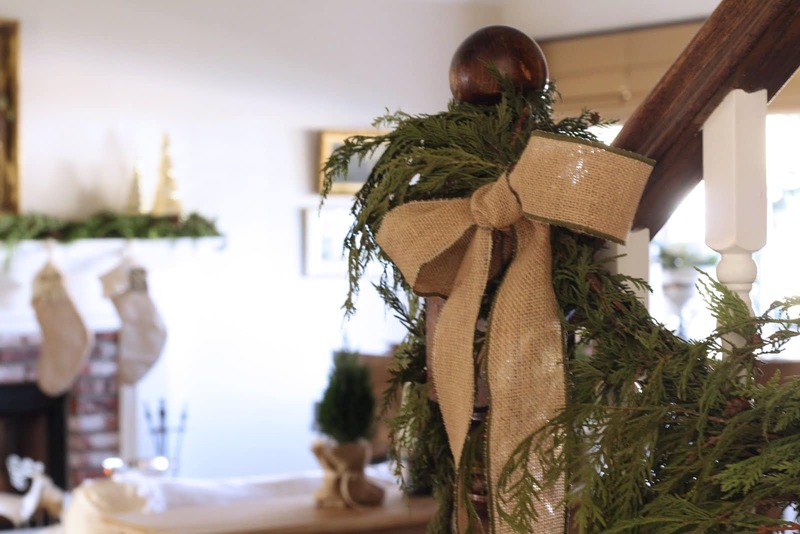 Your home looks amazing with all your beautiful touches. Mixing in all the vintage pieces make it extra special! 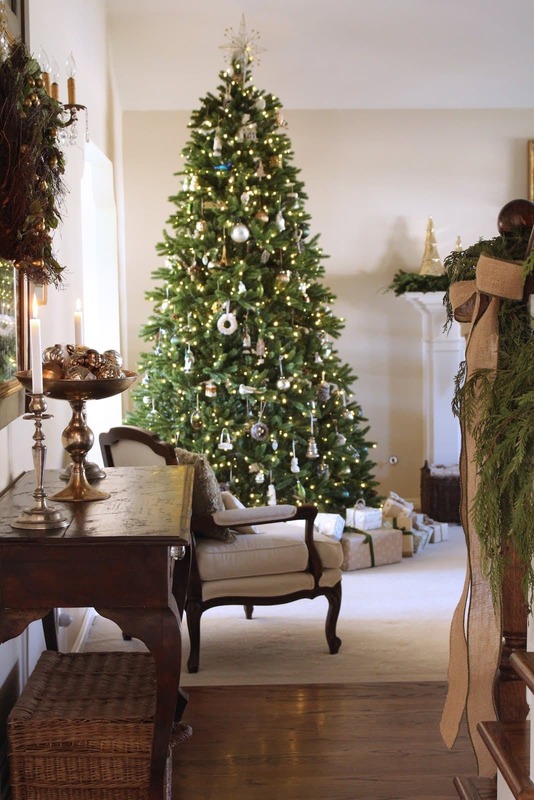 Love it all – and that huge tree is perfect for the room!